Start with: Initial value to start with sequence. Increment by: Step by which the values will get incremented or decremented. Minvalue: Minimum value of the sequence. Maxvalue: Maximum value of the sequence. Increment: Step by which the values will get incremented or decremented each time. 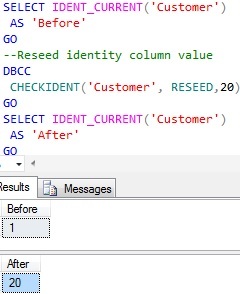 Only way to generate the next identity value is by inserting a record to the table in which the identity column is defined. 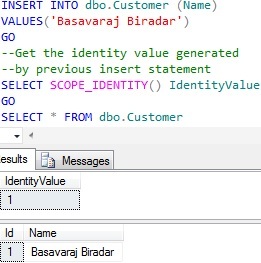 Example: The following script resets the Customer tables current identity value to 20. Sequence object provides an option to define the maximum sequence value. If it is not specified, by default it takes the maximum value of the Sequence object data type. 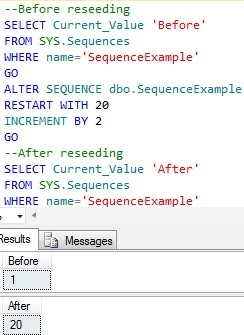 Sequence object provides an option of automatic restarting of the Sequence values.If during Sequence object creation the CYCLE option is specified, then once the sequence object reaches maximum/minimum value it will restarts from the specified minimum/maximum value. 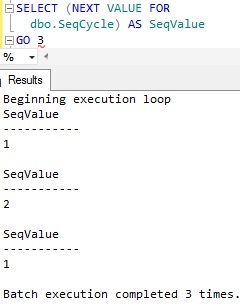 Example: Create a sequence object with CYCLE option which starts with 1 and when Sequence max value 2 is reached it will restart with minimum value 1. Sequence object provides sp_sequence_get_range to get multiple sequence numbers at once. Identity column property doesn’t provide an option to get multiple values. Sequence object provides an option to enable caching, which greatly increases the performance by reducing the disk IO required to generate the next sequence value. CACHE property allows to define cache size, by default caching is disabled. To Sequence CACHE management and internals you may like to go through the article: Sequence Cache management and Internals Identity property doesn’t provide an option to enable/diable the cache management and also to define the cache size.